Bamboo is the fastest growing woody plant in the world, capable of growing up to 4 feet every single day. 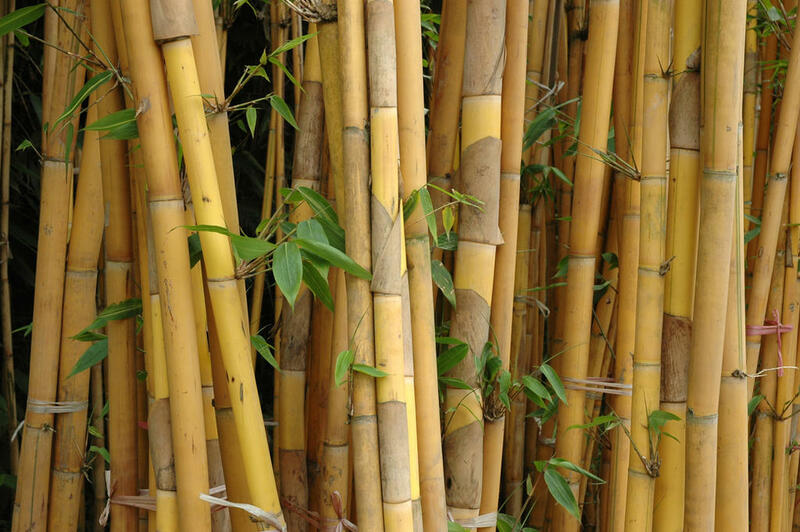 Just like hemp plants, bamboo trees can grow without the use of pesticides or herbicides making it very easy to grow organically. For the most part, growing bamboo trees can be considered sustainable. However, fabric made from bamboo can be a bit more controversial. Most bamboo fabric in the market today in any industry has a very smooth and silky feel to it, a lot like rayon, because essentially that’s what it is. Rayon is a regenerated cellulose fiber, which means that it starts out as an all natural raw material and then is converted into a fiber through a chemical process. This makes the fiber fall into a category between naturals and synthetics. Rayon’s cellulose source can be from wood, paper, cotton fiber or in this case bamboo. There are 2 main methods of producing bamboo into a fiber, Mechanical method and Chemical method. Generally, the mechanical method produces all natural bamboo fibers whereas the chemical method does not. The most common way and most widely used to create rayon fabric from bamboo is called the viscose process. In this process, the bamboo cellulose material is dissolved into a strong solvent to make a thick, viscous solution that is forced through a spinneret into a quenching solution where strands solidify into fiber. This process is sometimes called hydrolysis alkalization or solution spinning because the fiber is spun in a chemical solution. The solvent used for this process is carbon disulfide, which is a toxic chemical that is known to be very hazardous. Sodium hydroxide and sulfuric acid are also used during the viscose process and are potentially hazardous chemicals. Although fabric made from bamboo is generally chemically processed, it still retains a lot of popularity with consumers over most other fabrics. The most common benefit that people recognize as soon as they touch and feel the fabric is that it is super soft and is often described as feeling like cashmere! This fabric is also known to have some insulating properties helping you stay warmer in the winter and cooler in the summer. Bamboo viscose fabric (Rayon) is still known to have a natural moisture wicking agent helping evaporate any moisture that it comes in contact with. This in return makes this a very comfortable fabric to wear keeping the skin comfortable, rather than sticky in warm weathers. Even with the FTC’s crackdown on Bamboo product labeling and claims, this fabric continues to be on the rise with its popularity due to the benefits it has over the common fabrics used on the market today. There you have it. Bamboo products are really Rayon made from bamboo and are processed chemically. This viscose process extracts any eco friendly or organic benefits that come from bamboo. Although bamboo fabric is chemically processed it still remains somewhere in between natural and synthetic fibers so it might not be as bad to the environment as synthetic fabrics. Fabrics derived from bamboo have always intrigued us and we have been looking for ways to use this fabric on some of our new product releases for quite a while now. After a lot of research and development on bamboo fabrics we are very proud to announce that our next product release will be made using this material! We’re not giving any hints just yet… But all I can say is that these are super soft! If you’d like to know more please subscribe to our blog at the top of this page, enter our email newsletter and follow us on social media so that you never miss a beat!